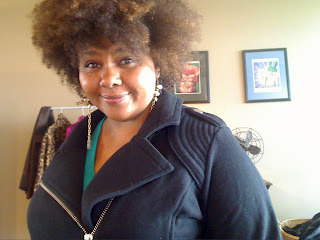 Multimedia mogul Patrice, of Afrobella.com and I have swapped articles! We are the first to see her winter routine! Wanna see mine? 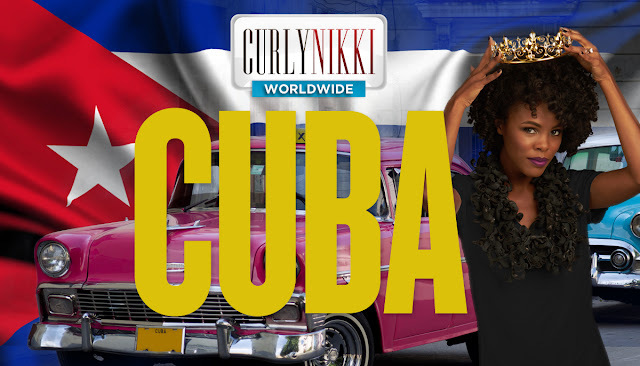 Head on over to Afrobella.com! My hair has a love/hate relationship with winter. Crisp cold air seems to bring out my curl pattern to noticeable effect - after the frizzy heat of summer, my hair is thrilled by the coolness of fall, and it spirals just the way I want it. As fall turns to winter, the spirally coils remain... but then my hair becomes dry, dry, dry. 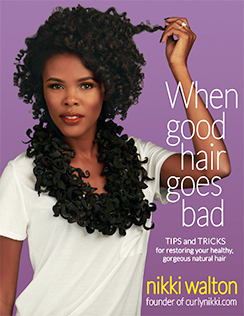 So it looks good, but feels brittle and often gets tangles and knots. My hair needs more love in the winter, and I have to combat the winter dryness with changes in my day to day regimen. This is what has been working for me! #1 - sleep on a satin pillowcase. For me, right now it's all about the Sharmooz. I change my bedding to warmer stuff in the winter - it's all flannel and plush microfiber. But under my head, it's silk and satin all the way. My head can't keep a bonnet on at night, so it has to be a pillowcase. The Sharmooz is one of the nicest I've been lucky enough to try - and it comes in a variety of beautiful patterns. #2 - I already don't shampoo more than once a week, tops - but during cold weather months it becomes even less frequent. In addition to deep conditioning, I also conditioner wash my hair once or twice a week, just so I can detangle it. My go-to everyday conditioner wash is currently the super affordable Suave almond and shea butter conditioner, which is great for my detangling purposes, and I also LOVE Darcy's Botanicals pumpkin seed moisturizing conditioner (http://darcysbotanicals.com/new-pumpkin-seed-moisturizing-conditioner.html). It's so seasonal and delicious-smelling! #3 - I need product in my hair as SOON as I get out of the shower! I keep my hair products and face lotion within reach so I can moisturize my situation while I'm still warm and moist from showering. I've been spritzing my hair with Oyin juices and berries, or sometimes I use Peter Lamas' Repair Me detangling mist. Then I use a heavier product from root to tip. In winter my hair's needs change completely - in the summer, my hair loves coconut oil. In the winter, my hair loves and needs castor oil and shea butter. So lately I've been using Oils from Jamaica castor oil- I pour a quarter-sized amount of castor oil in my hands, warm it up by rubbing my hands together, and then I basically style my hair with it. I also give myself a little scalp massage - I'm convinced that it's helped to cut back on my dry scalp issues. #4 - At least every 2 weeks, I do a deep, deep conditioning treatment with a heavier conditioning product. And when I do that, I also use the Huetiful Steamer. I like to use a really thick decadent treatment. That's when I'll break out my last reserve remnants of Ojon restorative treatment, or Miss Jessie's Rapid Recovery Treatment. The Huetiful is all that and then some. It's definitely made a difference in terms of maintaining my hair's moisture and health as the weather gets more and more frightful. #5 - If I'm going out to brave the elements, then I have to think about my headgear choices. If it isn't snowing, I'll go out as is and rock my fro big and curly. However, you lose so much heat through your head if you go walking around in cold weather...so I usually take a big scarf or I'll wear a big stretchy, slouchy hat to cover my whole head. It hasn't been easy, but I found a few - a big purple hat with ear flaps and a pompom on it by Jessica Simpson (got that at Marshalls!) and a gray one from Urban Outfitters which was too expensive if you ask me. I actually just heard from a fellow afrobella who makes silk and satin lined winter headgear - her site is http://www.hatsome.com/ - I'm trying to get one of her knit hooded scarves to get me through the season! Thanks for the info about the hats! I've been trying like crazy to find a site that had hats/scarves with a satin lining! I agree. Thanks for the hat info. Thanks for the love, ladies!! 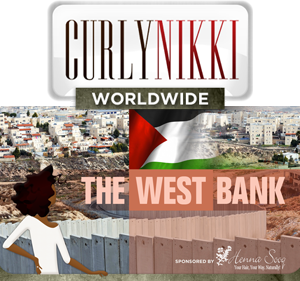 I have so much respect for Curly Nikki and the CN community, it's an honor to be featured! How is your hair handling the glycerine in Jucies n Berries during the winter? Hey LBell!! **waving** I love it here! It's still taking some getting used to, but I love life in the Chi and Midwestern people rule! Bonni - my hair is just fine with glycerine, but I do tend to use it more often if I'm not leaving the house. I work from home, so especially when there's snowy sidewalks out there and flurries in the air - I can reserve the right to NOT deal with it. The glycerine gives my hair a little extra softness and then I follow up with a heavier styling product (today it was Oyin whipped pudding) to amp up the moisture.